Meyer S, Woodward M, Hertel C, Vlaicu P, Haque Y, Kärner J, Macagno A, Onuoha SC, Fishman D, Peterson H, Metsküla K, Uibo R, Jäntti K, Hokynar K, Wolff AS; APECED patient collaborative, Krohn K, Ranki A, Peterson P, Kisand K, Hayday A.
AIRE-Deficient Patients Harbor Unique High-Affinity Disease-Ameliorating Autoantibodies. Cell. 2016 Jul 14. pii: S0092-8674(16)30792-9. T lymphocyte tolerance is essential for limiting autoimmune disease. 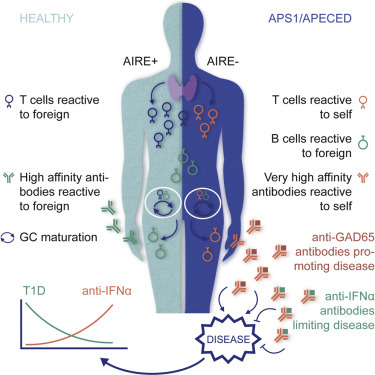 Tolerance occurs “centrally” (in the thymus) when developing thymocytes (cells from the thymus) with strongly self-reactive T cell receptors (TCRs) (Antigen recognition receptors are autoimmune targeting) are deleted following engagement of self-antigen-derived peptides presented by major histocompatibility complex (MHC) antigens (Each T cell attacks a foreign substance presented within a MHC molecule which it identifies with its receptor. T cells have receptors which are generated by randomly shuffling gene segments. Each T cell attacks a different substance. T cells that attack the body’s own proteins are eliminated in the thymus. Medullary thymic epithelial cells (mTEC) express major proteins from elsewhere in the body (so called “tissue-restricted antigens”), and T cells that respond to those proteins are eliminated through cell death (apoptosis), thus it is thought that AIRE therefore drives negative selection. So the self recognitition element that T cells must see to form a productive immune reaction. This + infection gives protective immunity against infection. This plus self can lead to autoimmunity. This needs to be avoided so in the thymus these cells are programmed to commit suicide with is known as negative selection. The cells that can recognise the MHC but are not reactive to self are selected and this process in part of positive selection) . The expression of thousands of tissue-specific self-antigens (TSAs) by medullary thymic epithelial cells (mTEC) is directly promoted by AIRE, a poorly understood transcriptional regulator. There are also several mechanisms of peripheral (in the lymph glands and the blood) T cell tolerance, including requirements for co-stimulatory signals for the activation of naive T cells; the expression of molecular “brakes” (e.g., CTLA-4, PD-1) by activated T cells; and the suppression of effector T cells by FOXP3-expressing T-regulatory (T-reg) cells. Central (in the case of B cells in the bone marrow) and peripheral tolerance mechanisms likewise shape the B cell compartment. Thus, self-reactive B cells developing in the bone marrow may be censored by clonal deletion, clonal anergy (non-responsiveness), or B cell receptor (BCR) editing in which secondary gene rearrangements replace the initial BCR with a new specificity Peripheral (in the lymph glands and the blood) B cell tolerance is less well characterized but tolerance is imposed as transitional B cells differentiate into naive B cells via T cell dependent mechanisms. Likewise, T cell help is required in the germinal centres where antibody forming plasma cells are created. The question that then arises is whether major defects in central T cell tolerance provoke wide-ranging losses of B cell tolerance at either or both of these stages. An approach to examine this in people who are AIRE-deficient, whose under-expression of TSAs in the thymus is predicted to lead to increased numbers of peripheral autoreactive T cells. Thus, people with APS1/APECED have autoantibodies against limited set of TSAs such as products affecting exocrine glands and they block type I interferons and TH17-related cytoines so they do not get rid of Candida infections. These people harboured autoreactive (neutralising antibodies) and by looking at their sequences it appears that the autoantibodies particularly develop by dysregulated reactions in the germinal centres, where T cells not tolerized in the thymus promote the competitive outgrowth and affinity maturation of B cells that were initially primed to exogenous antigen(s) but whose mutated IgGs bind to self-proteins. What has this got to do with MS? Maybe nothing, but in this study they report how autoimmunity may be blocked. However, it gives us ideas about how autoimmunity can develop. So Obrigado Cinara for bringing this to our attention. There are some testable ideas that come from this. When I read the news, andthe study itself, several questions come to my mind, as the most obvious is why those who have this Syndrome rarely develop other autoimmune diseases.